If you thought that the first half of 2011 was a little subdued with no hyped up designer and high street label collaborations or long queues outside high street stores, you might want to gear up for the second half of 2011 which is going to be a lot more exciting. 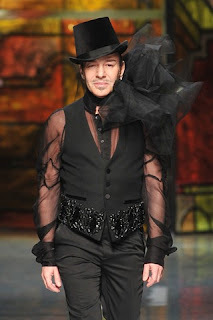 Word has been going around that Galliano will be doing a collection for Topshop. And while the whole fashion world is still speculating on whether this is true, I'm hearing that this is set to be the biggest collaboration ever, overshadowing H&M's tie up with Lanvin, Lagerfeld and McCartney. So is it going to be another Kate Moss-esque range, but ten times more drool worthy? I can't wait to find out.